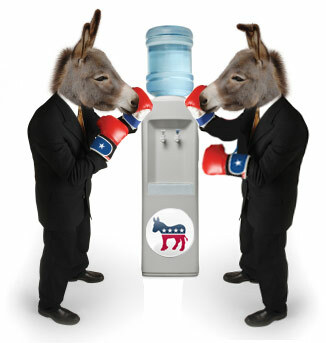 With the contest and name-calling between the Democratic presidential contenders becoming more and more heated as the April 22 Pennsylvania primary approaches, the debate over which candidate should represent the party is undoubtedly spilling over into the nation’s workplaces. certain ground rules be followed. Passions and tensions are high and the general election is still seven months away. The fight for the Democratic nomination is getting more rancorous and proponents of each candidate are getting more vocal. Political discussion is the hallmark of a free society, but when the debate enters the workplace, it can create some significant problems. Political debates in the workplace not only can present a possible disruption of productivity, but they can create a tension-filled work environment. In extreme cases, these debates can even become hostile. For co-workers who discover that they disagree on a hot-button issue like the war in Iraq or abortion, it can be difficult to set aside these differences when it comes time to coordinate on a project. The situation can be particularly uncomfortable if the political rift is between a worker and his or her supervisor. It is important to remain well-liked by your supervisor, so sharing political views with the boss can be a risky venture. Despite the risk, a 2008 survey by the American Management Association shows that 40 percent of business people surveyed are comfortable talking about politics with their supervisors. About 38 percent were uncomfortable discussing politics with their bosses and about 35 percent were uncomfortable talking about their political views with coworkers. Interestingly, some of those who feel comfortable talking politics with the boss may not be as comfortable sharing his or her true positions. A Vault.com survey of workers last December found that nine percent of workers feel pressure to conform to their supervisors’ political views. Most companies do not have a formal policy about political discussions in the workplace and most do not need one. However, it is something that department heads and managers should be mindful of in an election year. Nearly half of the Vault.com survey respondents have witnessed coworkers arguing about politics. When discussions escalate to arguments, it is time for management to intervene. For the most part, employees have to monitor their own behavior. One of the keys to political discussions at the office is to keep them brief and light. The last thing you want is for conversation to become confrontational. Supervisors should also be particularly careful about engaging subordinates in political debate. In today’s political arena, where political and religious views are often closely entwined, supervisors should avoid putting themselves in a position that could leave them vulnerable to discrimination lawsuits.